Season 5 has just premiered, and what better time to make new friends to flail and cry with? Our fandom might be small, but the fans are passionate about this quality project. Let's spread our love for this terrific show! Here's a new promo for Southland. Thanks to Cathymarie55 for posting it. And from the link above a slighty bigger picture of Ben and CMM! ( can be a bit spoilery). Sorry for the quality of the scan. From TV Guide issue December 24, 2012. Today was weapons training day and C. Thomas Howell @cthomashowell has tweeted a few pics. Thought I'd share if ok. 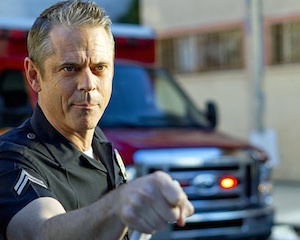 According to TVLine.com, C. Thomas Howell has been promoted to a series regular as of season 5. There is no other information about storyline, but it seems we'll now be seeing more of Dewey. Season 5 is scheduled to premiere on on February 13th. Southland has won "Location Team of the Year, Episodic TV" at this year's California On Location Awards. Southland along with the other nominees - CSI NY and NCIS - were nominated by film commissioners throught the state of California. The award was given out tonight at the Langham Huntington in Pasadena. During the acceptance speech, it was noted that they do about 27 location shots every episode (though they may have said 10 days). On a personal note - I would have been shocked if they didn't win due to the amount of location work the Southland does.